Coconut chutney for rice is made dry using coconut as the main ingredient and you can find many variations with in the coconut chutney for rice using different types of additional ingredients along with grated coconut which is the main ingredient for all coconut chutney recipes. Coconut chutney (whether dry or with gravy) is locally known as thenga chammanthi in Kerala. The word thenga chammanthi can be translated as coconut chutney where thenga means coconut and chammanthi means chutney (malayalam words as used in Kerala). 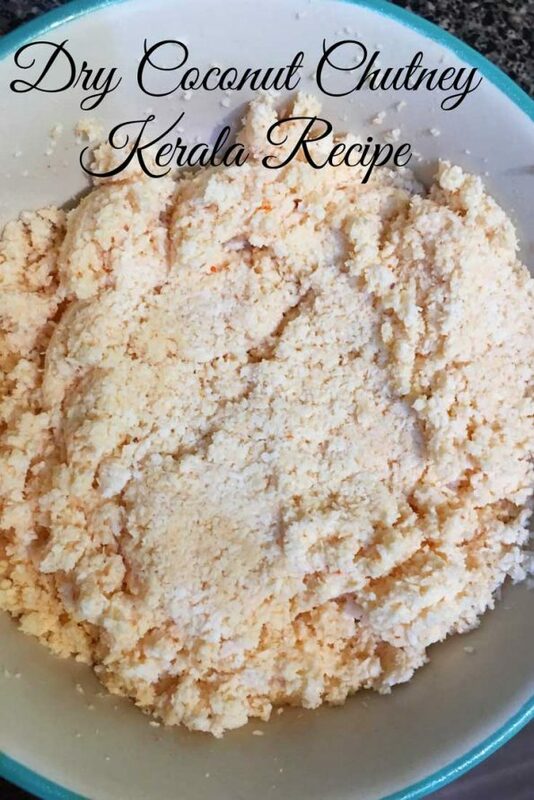 This Kerala recipe for dry coconut chutney for rice is a super easy no cook chutney recipe (uncooked chutney recipe) where you process the ingredients in a food processor using very little water and it is ready to be used. It is important to use a food processor instead of a blender as we use very little water and we need to grind the coconut in little water to form the dry chutney. There are some blenders that come with different jar and blades which can dry grind the ingredients, which you can use to make this chutney. If you don’t have that kind of a blender, you have to use a food processor to make this which is very easy to do in it. The texture of the end product should be like you should be able to make balls out of it with your hands. If you are looking for coconut chutney with gravy (which is not dry) you can see my post on idli chutney recipe here which is popularly used as a side dish with idli and dosa. Dry coconut chutney for rice is very popular in Kerala (where coconut is very abundant) and it is preferred for rice as a popular accompaniment. Even if there is no other side dishes, rice is enjoyed with a little dry coconut chutney(you can also use fresh yogurt and pickles) which is also the most simple vegetarian Kerala style lunch you can enjoy at your home. Rice with dry coconut chutney and little yogurt makes the perfect comfort food for me. You may not be able to find this simple dish in restaurants as this is not a fancy dish. However, dry coconut chutney is also enjoyed with a Kerala vegetarian meals where a lot of other dishes are served and this dry coconut chutney for rice goes well with rice at any time of the day. Another popular Kerala style vegetarian dinner combination is to use rice soup with green mung beans (or other beans) and dry coconut chutney. For example, you can take rice (or rice soup) with cherupayar thoran (green mung beans) and dry coconut chutney or you can take rice (or rice soup) with vanpayar thoran (red cowpeas) with dry coconut chutney. Rice soup is popularly known as kanji in Kerala, you can read more about preparing rice soup (kanji) and payar here. And dry coconut chutney is the perfect combination with rice soup and lentils and you can also add the Kerala style papadam to go with it. As I mentioned above, you can prepare the dry coconut chutney in different ways using coconut as the main ingredient and adding different additional ingredients. Here I am showing you one of the most simple dry coconut chutney recipes you can enjoy with rice, kanji (rice soup), dosa or idli which is made using grated coconut and ginger as the main ingredients. Ginger is definitely one of the most healthy herbs which you can ever find which is also a natural remedy for cold and even minor stomach pains ( and ginger is popularly used as a main ingredient in many home remedies and also ayurveda which is the traditional medicine popular from ancient times in India). Ginger helps improving the immunity of the body and helps it fight against diseases, so it is always good to include ginger in recipes if possible. Ginger adds spiciness to this dry coconut chutney, I have also used little red chili powder which adds more spiciness, so this dry coconut chutney is quite spicy (but not too spicy). If you don’t like spicy food, I will recommend you to reduce the red chili powder or skip it if you wish. So here is how we prepare this dry coconut chutney for rice, idli and dosa using coconut & ginger as the main ingredients. South Indian Kerala style dry coconut chutney made using coconut and few other ingredients including ginger, makes a very simple, delicious, healthy side dish with rice, dosa and idli. Peel the shallots or pearl onions. 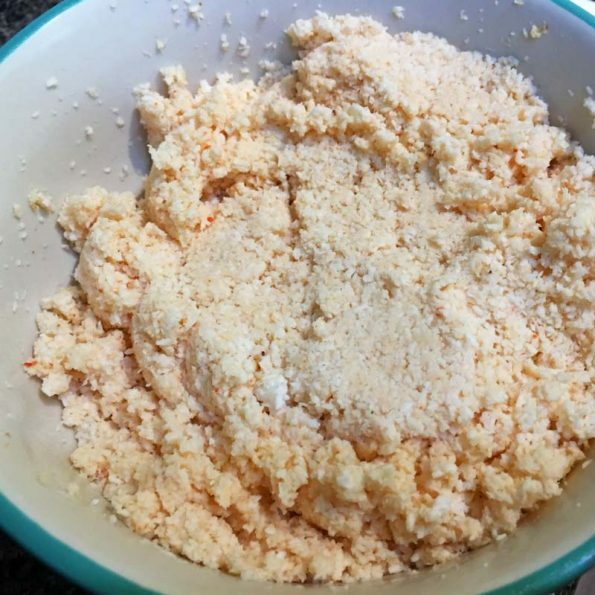 Take all the ingredients other than water in a bowl and transfer this to the food processor. Add very little water to the ingredients and dry grind the ingredients well. Add the remaining water too, and grind again until you get a smooth but coarse grind coconut chutney. As I already mentioned above, the right texture of this chutney is that you should be able to make balls out of it using your hands. In case the chutney is too dry to make balls, you may add more water little by little and slightly grind again so you get the right texture of the dry coconut chutney. Serve your spicy, yummy dry ginger coconut chutney with rice or idli or dosa as you wish. If you are serving with rice or kanji (rice soup), the traditional way is to make a small ball of coconut chutney from the prepared chutney and serve this with the rice as a single ball of chutney makes 1 serving of coconut chutney for rice. But this is not mandatory, you can also easily serve this coconut chutney for rice using a spoon as usual. Hope you found this post on ginger coconut chutney for rice, dosa and idli helpful!